Why not take advantage of these handy retail sized bottles! Brewing Guide For an authentic Bombay chai latte add 1-2 tablespoons (1fl oz) of chai concentrate to 6fl oz of your favourite milk. Heat in a pan, steam or microwave to your preferred temperature and enjoy. For an iced Bombay chai latte, simply pour chai concentrate over ice in a tall glass, add cold milk of your choice and stir. 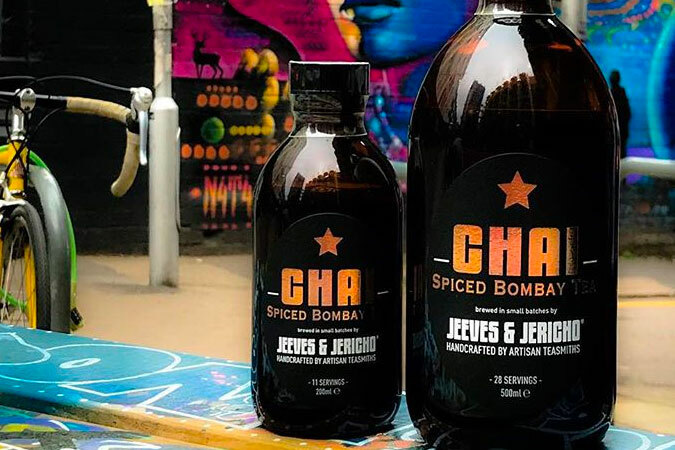 Check out our dedicated Chai website www.spicedbombaychai.com where you'll find a number of interesting and alternative fun ways of how our new chai can be used other than in your favourite drink. Chai is one of the most popular drinks in India, used in Ayurvedic medicine for its calming and revitalizing effect on the body and mind. Jeeves & Jericho's all new warming Spiced Bombay Chai concentrate is 100% natural using only the finest hand picked tippy Assam tea and spices which are slowly steeped and brewed in small batches, creating a powerful balance of comforting flavours. Jeeves & Jericho source their spices from collectives across the globe, paying particular attention to their place of origin, growing conditions and quality. Each spice is cupped to maintain consistency in natural sweetness and body. The result is a totally unique full-bodied and balanced easy to use tea concentrate. Mix one part concentrate to six parts of your favourite milk and you will enjoy a bold and flavourful simple to produce authentic Spiced Bombay Chai latte. Ingredients Single estate Assam black tea, purified water, un-refined Madagascar sugar, cloves, cinnamon, black pepper, star anise, mixed spice, nutmeg, cardamom, fennel seed and all spice. NATURALLY CONTAINS CAFFEINE. Dairy, additive, preservative and gluten free. Vegetarian Society approval pending and vegan friendly. Origins Ethically and responsibly sourced from India, Sri Lanka, Madagascar and Grenada.